It makes sense to choose a decentralized solution when there are limited alternatives, for instance, in remote areas; and when the cost of building delivery infrastructure to a centralized facility is higher than building a decentralized facility with a local network. Decentralized solutions also mean easier permitting, faster implementation, and reduced operating costs. Fluence can deliver its decentralized treatment solutions as a turnkey project, leased equipment, or water-as-a-service (WaaS). Please check our project financing page for more information. 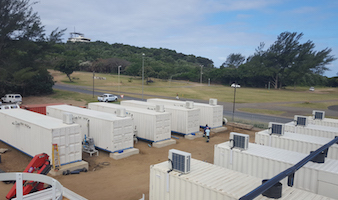 Our decentralized solutions include a range of containerized, pre-engineered, prefabricated, and packaged water and wastewater treatment systems. Our NIROBOX™ product line features modular desalination, and water and wastewater treatment facilities installed in standard 40-foot shipping containers. The self-contained units are plug-and-play, easy to deploy, and more cost-effective than conventional plants. Larger plant capacity can be achieved by combining containers. Nirobox can be used for seawater and brackish water desalination, removing contaminants from fresh water, and for the production of drinking, process, and ultrapure water. The plants can be up and running in less than four months from receipt of the purchase order. For municipal wastewater treatment, our membrane aerated biofilm reactor (MABR) product line is particularly suited to decentralized settings. Our products are pre-engineered and preassembled, and can be up and running in record time. Our innovative MABR technology integrates a natural nitrification-denitrification process and passive aeration, which uses up to 90% less power than conventional aeration technology. MABR treatment produces effluent suitable for environmental discharge or irrigation. We can also deploy our highly successful Tipton plants, which are proven and robust extended aeration packaged plants for municipal, commercial, and industrial applications. Fluence has dozens of reference sites using Tipton wastewater plants. 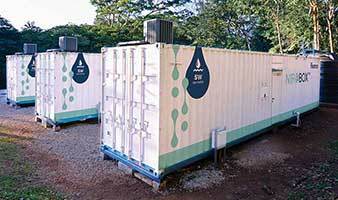 The Fluence EcoBox™ is a tertiary treatment suite housed in a 40-foot shipping container. It includes pretreatment, ultrafiltration, reverse osmosis, advanced oxidation, and disinfection. Our Ecobox product takes secondary effluents and produces process water or ultrapure water for industrial and commercial use. Our plants are fully automated and are controlled by our innovative Smart Operation suite, which features real-time monitoring and response, as well as optimization of operating costs. Are you looking for a localized water or wastewater treatment solution? Decentralized treatment can save money on distribution infrastructure, particularly when it comes to remote sites. Contact our experts to discuss your specific project details, and learn how Fluence’s decentralized solutions can help you meet your goals. We’re here to help! Contact us to learn more about our decentralized water and wastewater treatment solutions, or to discuss your next project with our experts. Due to an ongoing drought, a beach resort, golf course, and spa in Costa Rica was facing water scarcity. It needed a solution with a high recovery rate that featured low energy consumption and minimal use of chemicals. The system had to be quiet, have a small physical footprint, and a low ecological impact. Three Nirobox units were installed, with a total treatment capacity of approximately 1,500 m3/d, providing disc filtration, ultrafiltration, seawater reverse osmosis, and remineralization to drinking-water quality. The system was started up only eight months after it was ordered, with a plan to gradually increase reliance on the system with the approach of tourist season. The Bordeaux area of St. Thomas needed a wastewater treatment plant to replace an old one that didn’t meet environmental regulations or industry standards. 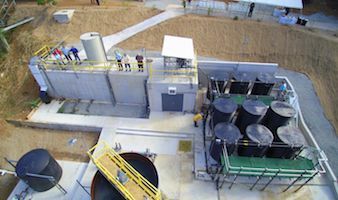 An MABR plant was designed, delivered, and started providing high-quality effluent within seven months. It currently provides economical wastewater treatment for 200 homes, and can be easily expanded if required. The plant’s quiet, odorless performance was important on the island, which relies on tourism.